Your face will thank you after being treated to one of Eco Bali Spa’s facial treatments. Imagine a 60-minute treatment focused on your face. 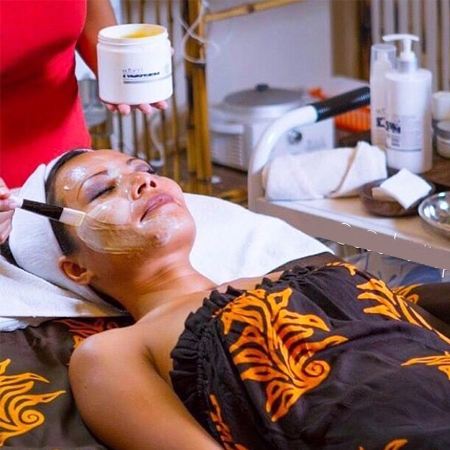 The procedures involve a variety of skin treatments including a deep cleanse, steam, exfoliation, peels, a cell stimulating massage, an invigorating scrub, and finishing with a soothing mask. The products we use on your skin have been developed specifically for dry, oily, sensitive or mature skin. For Traditional Facials we use traditional ingredients to suit your skin. This 60-minute procedure involves a variety of skin treatments including a deep cleanse, steam, exfoliation, peel, a cell stimulating massage, an invigorating scrub, finishing with a soothing mask. The Biokos products we use on your skin have been developed specifically for dry, oily, sensitive or mature skin. Microdermabrasion is a fairly simple, easy, painless, non-invasive, skin rejuvenation procedure using a combination of a fine abrasive tip or crystal and vacuum suction applied to the skin. Typically there are no needles or anesthetics required for microdermabrasion. Our microdermabrasion treatment comprises two parts: an exfoliating material like crystals or diamond flakes and a machine based suction to gently lift up the skin during exfoliation and remove the outermost layer of dead skin cells from the epidermis. It will start with a gentle cleanse and finish with a soothing mask.